Sooner Comfort Food. 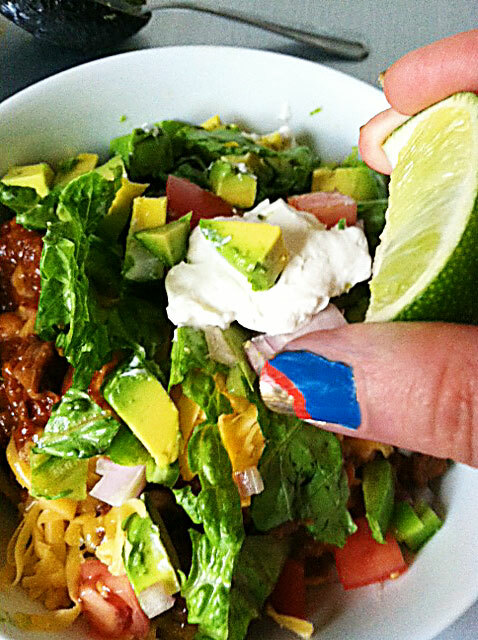 Dressed up Frito Chili Pie… and yes, that is an OKC Thunder inspired manicure…. I first enjoyed Frito Chili Pie on a camping trip in middle school. There, we pulled the top off of a can of Wolf brand chili and tucked it into the coals of a campfire. Then we slashed an ‘X’ into the belly of a bag of Frito’s Corn Chips, poured the chili right on top, and crowned the whole thing with a handful of cheddar cheese. 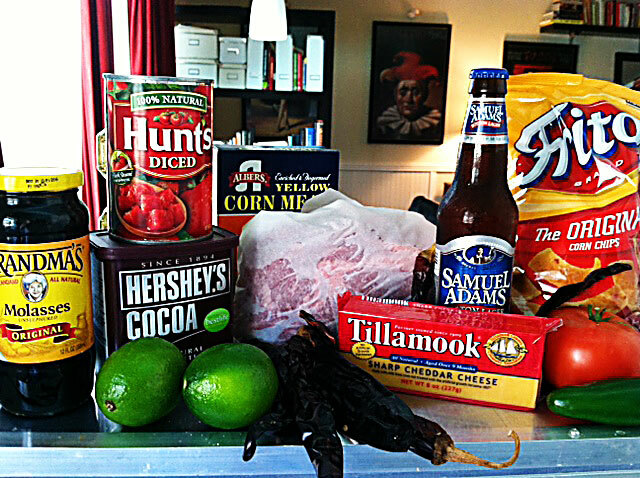 To say it is a humble dish would be to elevate Frito Chili Pie, really, but you know what? It is super tasty. And, until last summer, you could get it at Sonic Drive-In, my favorite fast food place from growing up in Oklahoma City. It’s even better when you say it the Okie way– freed-o chili pah. Try it. You can’t say it without smiling. I’m going to blow your mind for a minute, but guess what? 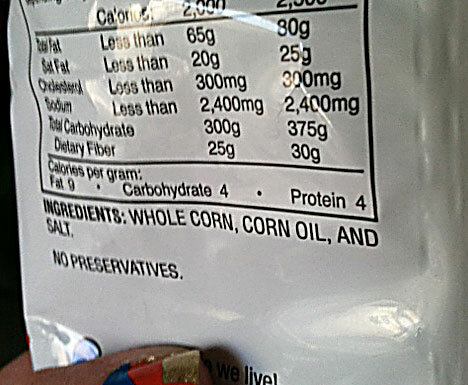 Fritos are gluten-free, and only have three ingredients. It’s an oldie but a goodie. While I am sure that Frito Chili Pie has been created on many campsites and college dorm rooms, to me it will always be Sooner Comfort Food. When I learned that the Gent had never had it, well…. I decided to recreate it, only slightly elevated. The first thing you need with a grown-up Frito Chili pie is a great chili base. I started with the Cook’s Illustrated “Our Favorite Chili” version, and tweaked from there. Cook’s Illustrated does a couple of genius things in their recipe, using cornmeal as a thickening agent, adding a cocoa and molasses to give great depth of flavor, but the most genius thing they do is use the lager to de-glaze the skillet that you brown the meat in, so all the meaty goodness ends up in the finished chili. The CI version is definitely spicier than the version I have here, as much as I love the flavor of a good spicy dish, my throat and stomach are not such big fans. By adjusting the spice down a bit, this chili is a bit more accessible to a wide audience. Serve it with garnishes of chopped jalapenos and hot sauce so guests can add more heat if they like. Combine 3 tablespoons salt, 4 quarts water, and beans in large Dutch oven and bring to boil over high heat. Remove pot from heat, cover, and let stand 1 hour. Drain and rinse well. Add guajillo chiles, cornmeal, cayenne, oregano, cumin, cocoa, and ½ teaspoon salt to food processor; process until finely ground, about 2 minutes. With processor running, very slowly add ½ cup broth until smooth paste forms, about 45 seconds, scraping down sides of bowl as necessary. Transfer paste to small bowl. Place onions in now-empty processor bowl and pulse until roughly chopped, about four 1-second pulses. Add jalapeños and pulse until consistency of chunky salsa, about four 1-second pulses, scraping down bowl as necessary. Heat 1 tablespoon oil in large Dutch oven over medium-high heat. Add onion mixture and cook, stirring occasionally, until moisture has evaporated and vegetables are softened, 7 to 9 minutes. Add garlic and cook until fragrant, about 1 minute. Add chili paste, tomatoes, and molasses; stir until chili paste is thoroughly combined. Add remaining 2 cups broth and drained beans; bring to boil, then reduce heat to simmer. Meanwhile, heat 1 tablespoon oil in 12-inch skillet over medium-high heat until shimmering. Pat beef dry with paper towels and sprinkle with 1 teaspoon salt. 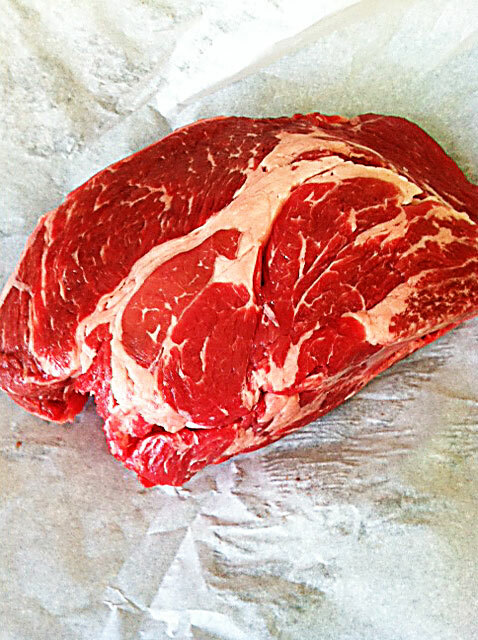 Add half of beef and cook until browned on all sides, about 10 minutes. Transfer meat to Dutch oven. Add ½ bottle lager to skillet, scraping bottom of pan to loosen any browned bits, and bring to simmer. Transfer lager to Dutch oven. Repeat with remaining tablespoon oil, steak, and lager. Once last addition of lager has been added to Dutch oven, stir to combine and return mixture to simmer. Cover pot and transfer to oven. Cook until meat and beans are fully tender, 1½ to 2 hours. Let chili stand, uncovered, 10 minutes. Stir well and season to taste with salt before serving. Get some good meat for this dish– that’s where your foundational flavor comes from. Place a handful of corn chips in the bottom of a bowl. Smother in chili. Top with cheddar cheese and whichever garnishes you prefer. Posted in food blog, Hospitality and Home, Yum	Hospitality @ Homethunder! Next > More Than You Ever Wished to Know About Lemonade….